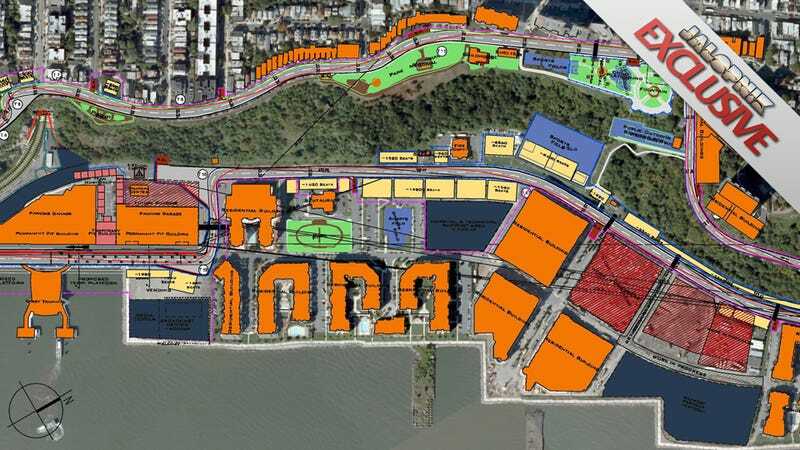 A new leaked document reveals the exact layout and plans for the next Formula One circuit, the Grand Prix of America in New Jersey. The map explains some of the many challenges in bringing F1 to the New York metro area. You can view the master plan in full here. The track runs clockwise, starting along the Port Imperial Ferry Terminal on the Hudson in what will be the pit straight. The cars make a 90 degree left for Turn One, then quickly transition into the right-handed Turn Two. The cars then turn up to the great feature of the track: the Palisades. The Hudson is banked on New Jersey by this massive rock formation — up past the George Washington Bridge, it forms a sheer cliff of exposed rock looking down on the river. Down at the track, it accounts for 150 feet of elevation change. Elevation change, traditionally, is what makes a track great and it has been seriously lacking from Formula One circuits built in the past fifteen years. Surprisingly, the same man who designed this "Port Imperial Street Circuit" in New Jersey is also responsible for the incredibly dull racetracks of Malaysia, Bahrain, Singapore, Valencia, Abu Dhabi, and Korea. His name is Hermann Tilke and he has been the bane of Formula One fans for the past decade and a half, constantly designing tracks that sacrifice challenging turns and opportunities for exciting racing in the name of safety and clean views for television cameras. The general layout of this track isn't news; last October, we got a clear view of what the track will look like at its opening presentation and we've driven the route itself. What we see in this master layout is the first detailed plan of the barriers, the stands, the added facilities, and everything else that integrates the track with the built-up area along the Hudson. From the main kitchens to just how close the cars will pass by the sewage treatment plant on the north side of the track — it's all there. The master layout also makes it easy to understand the skepticism that has surrounded the track over the past two years, and why some expect the race to be delayed until 2014. When rumors first circulated that the Formula One circus might come to the New York area, the track was expected to go to Liberty State Park. The current site in Weehawken and West New York seemed already too densely populated. It's amazing to think the plans got approved not only for the wailing field of F1 cars streaming by multiple highrises, but also for the annual construction and deconstruction that must happen before and after each Grand Prix weekend. Could The New Jersey Formula One Grand Prix Be Delayed Until 2014? The main selling point of the track is the views you'll get of the Manhattan skyline as the cars tear down the Palisades. Of course, as Vettel and Hamilton and everyone else approach the hairpin of turns 14 and 15 by the Hudson, they'll pass right by the aforementioned sewage treatment plant. The track won't have quite the glamour of the Monaco or Singapore Grands Prix, and it has a long way to go before it's ready for F1 cars. Difficult as it may be to keep this Grand Prix of America funded and on schedule, it looks like the Port Imperial Street Circuit itself has serious potential for greatness.